By common consent there will be a great international cable jubilee, on the 1st and 2nd of September, throughout the United States, the Canadas, and Great Britain. Boston, Montreal, Buffalo, Chicago, St. Louis, St. John's, New Orleans, London, and in fact most of the leading cities of this country and England, have signified their desire for such a demonstration, and arrangements are in progress to carry it into effect. 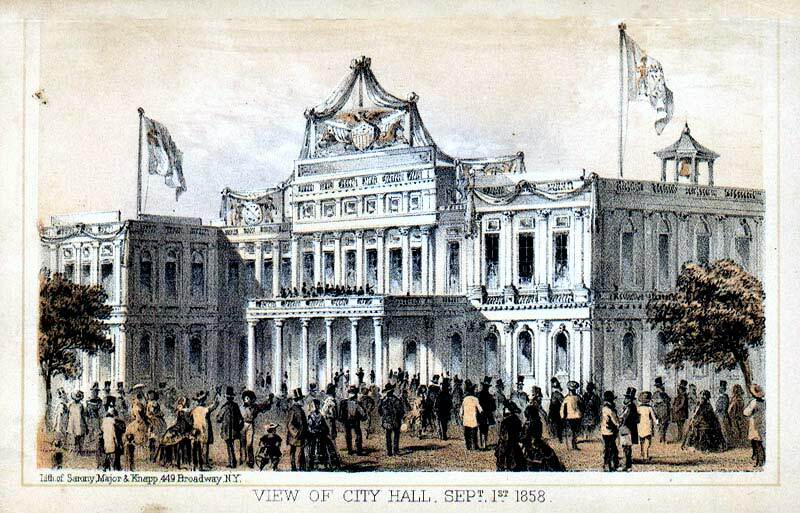 The great cable jubilee in New York City is documented below, and of the many celebrations in other cities in New York State on September 1st, those in Clyde and Albany are documented elsewhere on the Atlantic Cable website. 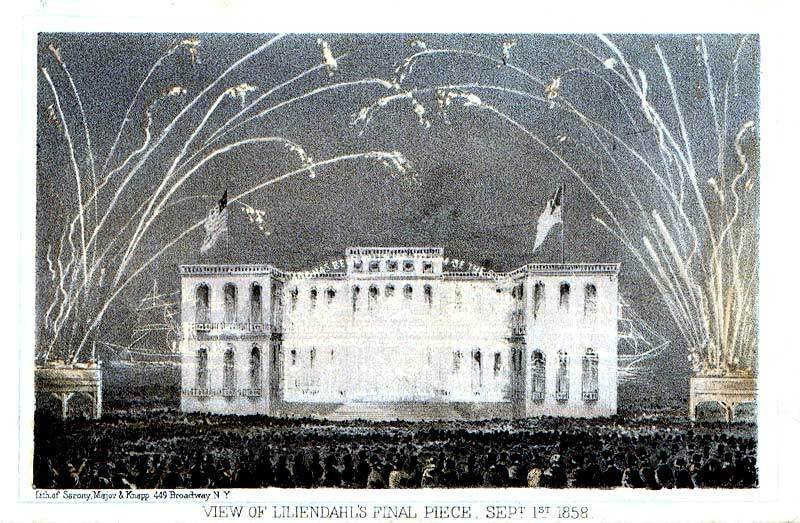 “the City Hall and the public buildings of New York were brilliantly illuminated, and a magnificent display of fireworks, presented by Mr. J. Edge, Jr., was exhibited in front of the City Hall on the evening of the 17th August. THE NIAGARA AT THE NAVY YARD. The Niagara was visited yesterday by throngs of people, men, women and children. Row-boats were constantly plying between the Brooklyn wharves and the frigate, their owners making the most of and by the occasion. The gangway was uncomfortably crowded with visitors coming and going. From the forecastle or quarter-deck the vessel looked like the principal thoroughfare of a well-peopled city, where sailors, soldiers and civilians are constantly passing and repassing. Among the visitors was Gov. King, to whom Capt. Hudson showed the ship and explained the paying-out machinery in detail. The Governor shook hands with the officers on board with great heartiness, and congratulated them upon their participation in the enterprise, so successfully brought to completion. Everything on board the Niagara remains as it was when she dropped her end of the cable in Trinity Bay—the unused coils where they were, and the wheels and the brakes. 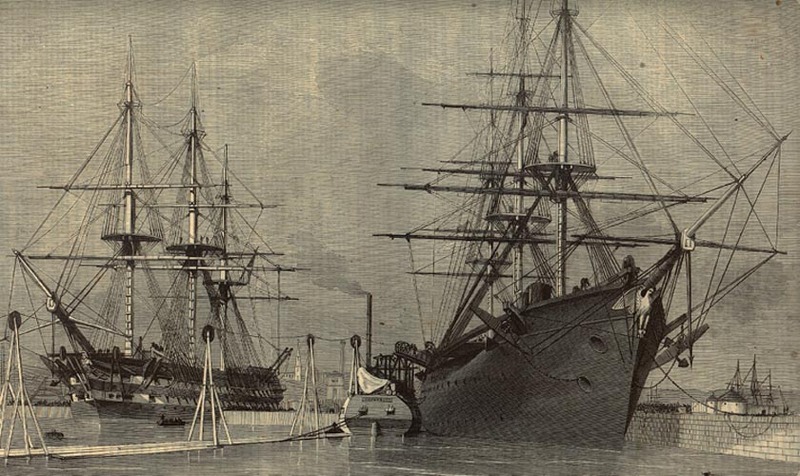 No person should neglect to avail himself of the present opportunity to see how the cable was laid, as well as to examine the fine frigate which assisted in laying it. On September 1st, the day began with services at Trinity Church, which was filled to overflowing. 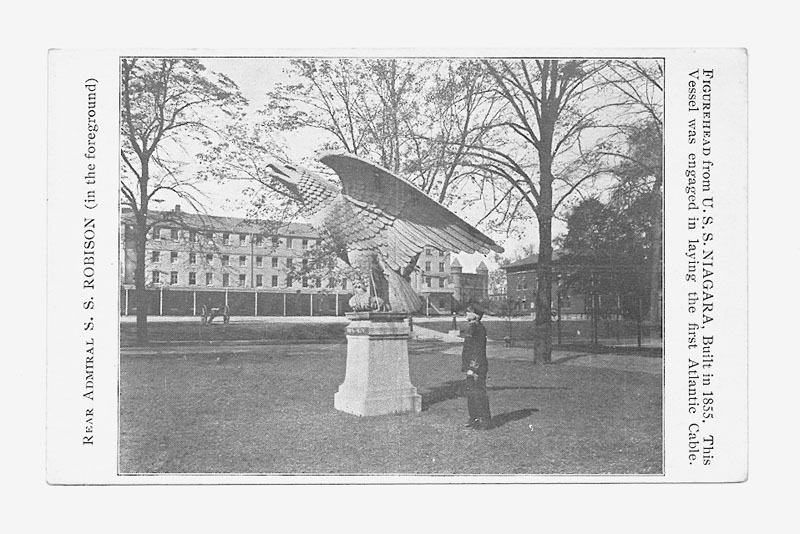 At noon Cyrus Field and the ships’ officers landed at Castle Garden and received a national salute. A procession formed and extended from the Battery to the Crystal Palace at 5th Avenue and 42nd Street, where many addresses were made. 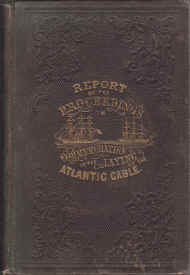 The Atlantic Telegraph Jubilee, New York. 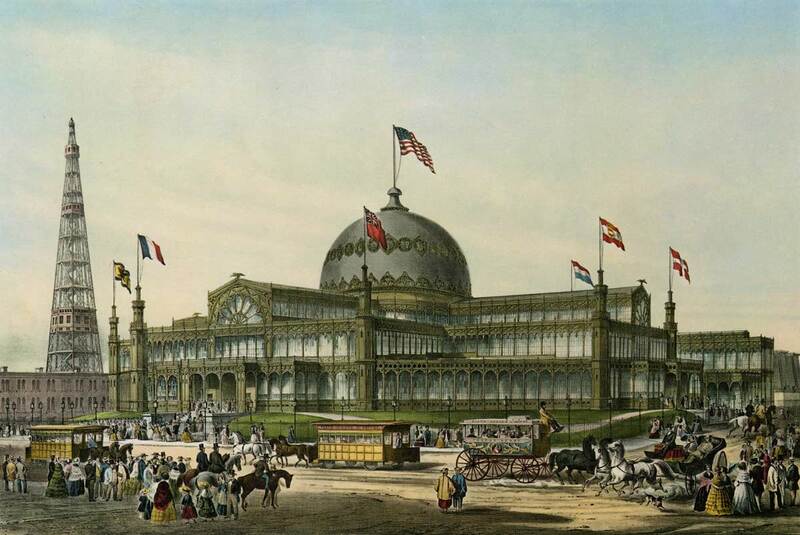 sold by the London Stereoscopic Co. 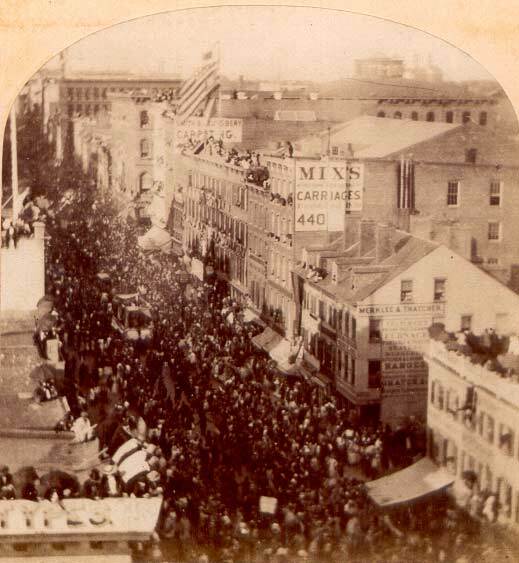 The accompanying photograph was taken instantaneously during the passing of the procession up the Broadway, the entire line of march through this great thoroughfare being “profusely decorated with flags of every nation, festooned upon the stores and houses, or drawn across the street, while paintings innumerable. to become transparencies at night, adorned the majority of the buildings,” At night the illuminations, fireworks, torch-light processions, etc., etc., were on an unparalleled scale of magnificence. “The firemen’s torch-light parade concluded the day’s festivities. It was exceedingly beautiful, and as the long line moved through Broadway surrounded by an enthusiastic crowd on every side, and lighted by thousands of torches, candles, and colored lanterns, one might easily have imagined himself in a fairyland. It was long after midnight before the great assemblage dispersed, and even then the streets did not resume their wonted aspect. . . . The fact is, that an avalanche of people descended upon us, and New York was crushed for once; but we do not lay Atlantic cables every day”. 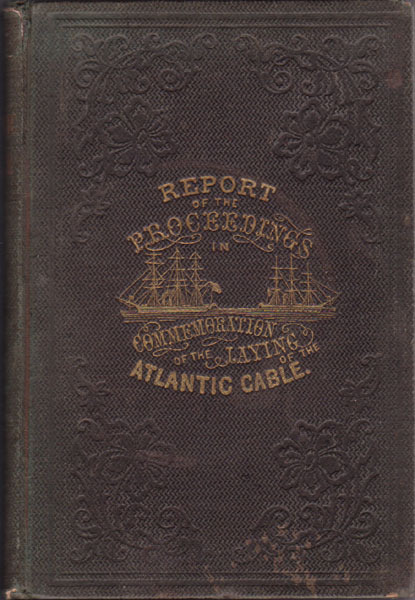 The Special Committee appointed for the purpose of making suitable arrangements for the celebration incident to the laying of the Atlantic Telegraph Cable made its report in 1859, but the report was not published until 1863 as: Detailed Report of the Proceedings had in Commemoration of the Successful Laying of the Atlantic Cable, by order of the Common Council of the City of New York, by Charles T. McClenachan [New York 1863, Edmund Jones & Co, Corporation Printers, No. 26 John Street]. 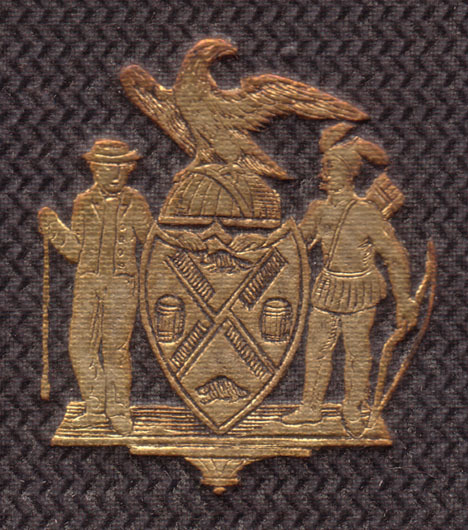 The Seal of New York City is shown on the back cover of the book. Appropriately, the sailor on the left holds a sounding line. Also note the cable in the eagle’s talons, not found on the standard version of the seal. The Committee spent $25,000 on the event, not including the value of all the donated materials and services. The descriptive text for the images is taken from the Report of the Proceedings. The lithographs as published in Valentine's Manual were accompanied only by the captions shown below each image. (from David Dudley Field’s oration at the Crystal Palace). 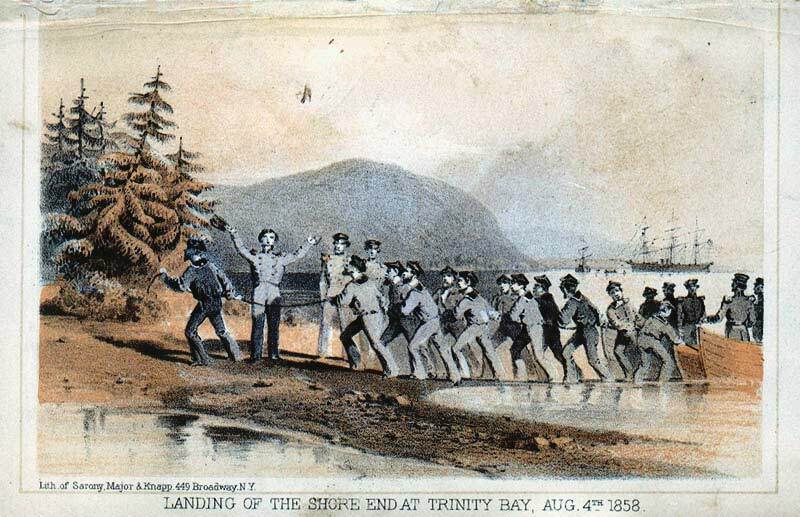 “At length, on the morning of the 4th of August (1858), under as bright a sky as ever smiled on a great achievement, the headlands of Trinity Bay rose above the sea directly before them. 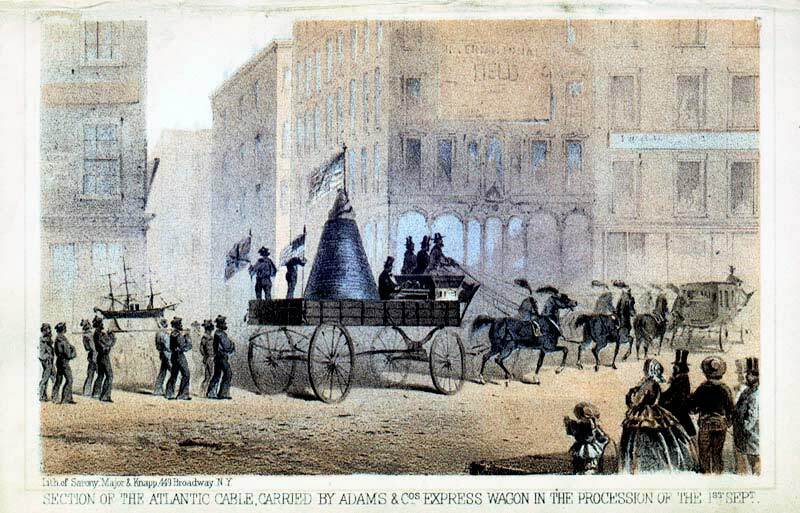 in the Procession of the 1st Sept.
“The other portion of the procession that came in for a very particular manifestation of enthusiasm was the large coil of the Atlantic Telegraph Cable, which was neatly wound around a pyramid on a car drawn by six horses, gaily caparisoned with flags and plumes. This important part of the display was confided to the care of the brave sailors of the Niagara, and the handsome team by which it was drawn was furnished by the American Express Company. “It had been arranged that the procession should arrive at the Palace at four o’clock, or as near to that hour as might be practicable. In anticipation of this, the doors were thrown open at two, and immediately the building began to fill. Those to whom green tickets had been given entered by the main door, on Sixth avenue; those who obtained white tickets were admitted through the side entrance, on Fortieth street, and had access to the galleries in the vicinity of the platform, which was erected in the nave, and extended backwards from the centre to the eastern window. The platform proper occupied but half of this space. Midway between the fountain (which is directly beneath the dome, and but a few feet from the front of the platform,) and the eastern end of the nave, commenced the first of a tier of seats which, rising by regular gradations from the stand, terminated at the farther wall and on a level with the galleries. 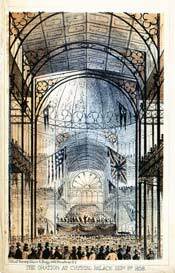 “From all the flagstaffs on the Hall gay banners and streamers were flying. Surmounting the centre of the roof was a painting representing the national bird with wings outspread, standing on a starred and striped shield, as if just lighted there, with the lion and the American standard under his right pinion, and the English standard and unicorn under his left. 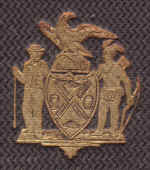 Under this was the name of FRANKLIN in large letters, one one side, the coat of arms of the State of New York, and on the other the coat of arms of the City of London. “At one end of the inscription appeared an old-fashioned printing press, at the other, a telegraphic apparatus. “At 10 o’clock the head of the procession started. Note: The Report spells this pyrotechnician’s name variously as Gust. A “Lillienthal” and “Lilliendahl” . “All the day, from the moment the sun marked early breakfast-time until he set in a cloudless West, workmen were putting up curious sticks and odd cross-bars along the front of the dilapidated City Hall. These sticks and bars were the foundations of a cable and two ships, with all the accompaniments necessary to give the telegraph a fiery salute. At nightfall the work was finished, or rather so far finished that it was ready to be begun when eight o’clock came. 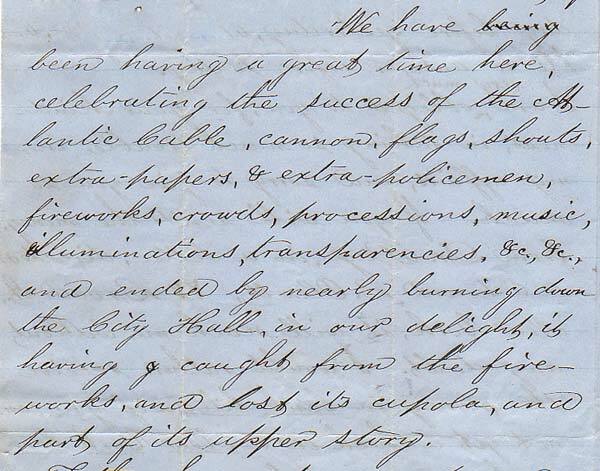 Note: The Report records this banquet and fireworks display as taking place on Thursday September 2nd, 1858, not September 3rd as Sarony has it. “Grand finale. 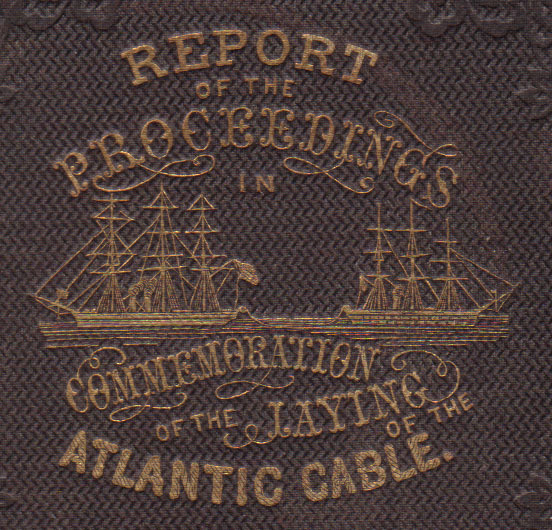 The laying of the Atlantic Cable. 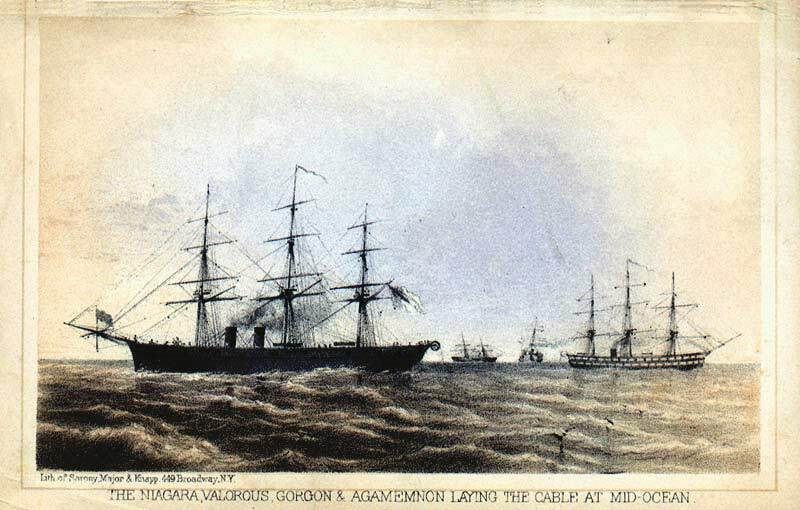 In this piece some new principles were attempted for the first time in the pyrotechnic art; the open portion representing the Niagara and the Agamemnon in the centre, with the tenders Gorgon and Valorous ahead; on the extreme ends of the piece were two light houses connected by a line of rolling waters, on which the ships slowly moved towards their destination; on arriving at which the centre was suddenly transformed into a magnificent temple of science, in all the splendor of the dazzling colors, assisted by all the mechanical contrivances of which the art is capable. Canopied by an arc of stars which rested on revolving columns, upon whose base were recorded the names of Franklin, Morse and Field, appeared a group of figures representing Science uniting Columbia and Britannia. Over these was an entablature with the motto: ‘The electric flash shall belt the earth.’ The crowning portion showed the American coat of arms, in which was entwined the Union Jack with the Stars and Stripes. “In order to do honor more fully to this great success of science over time and space, it was found desirable to employ electricity, thus creating an actual as well as an imaginary current through the entire length of the piece. “The whole concluded with batteries of candles, flights of rockets and bomb shells, filling the air to a great distance with colored stars, gold rain, fiery meteors, serpents, &c.
Napoleon Sarony was born in Quebec in 1821. He moved to New York around 1836 and studied with Archibald Robinson. 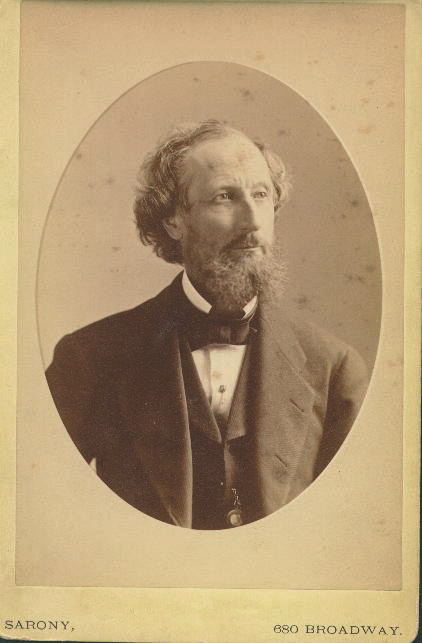 He worked for Nathaniel Currier before starting a business with James P. Major in 1843. 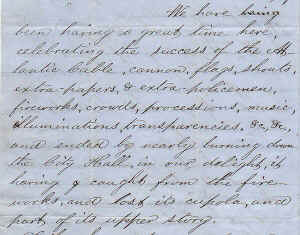 In 1845 James Major was replaced by Henry B. Major in Sarony & Major. 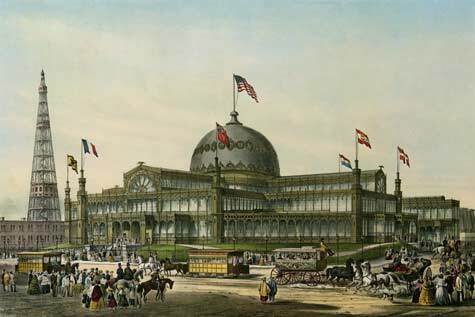 Sarony’s next corporate incarnation was known as Sarony, Major & Knapp in which he was joined by Richard Major and Joseph F. Knapp from 1857 to 1867. He withdrew from the firm around 1867 to establish a studio of photography. Sarony later spent six years in Europe, where he visited lithographers in Berlin and Paris. He eventually returned to New York and set up another photographic studio. He died in 1896. 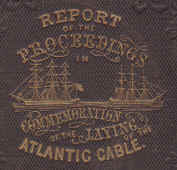 OF THE ATLANTIC TELEGRAPH CABLE. 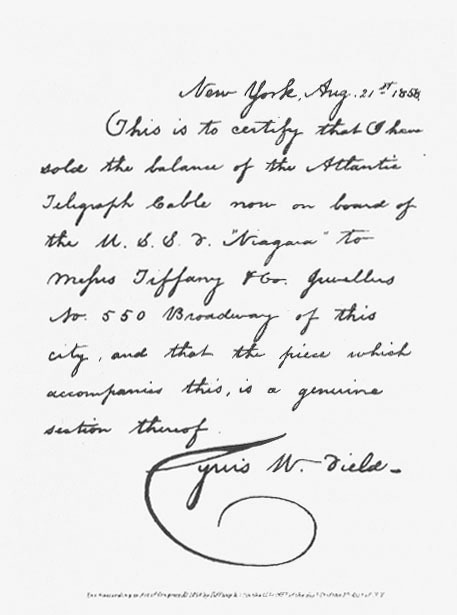 The publication of her Majesty’s message to the President of the United States on the morning of August 17, carrying with it, as it did, the assurance that the telegraphic wires were really capable of transmitting despatches, caused an outburst of enthusiasm in the Atlantic States which might almost be characterised by the American qualificative “universal.” Wherever the news penetrated there was a public jubilee. 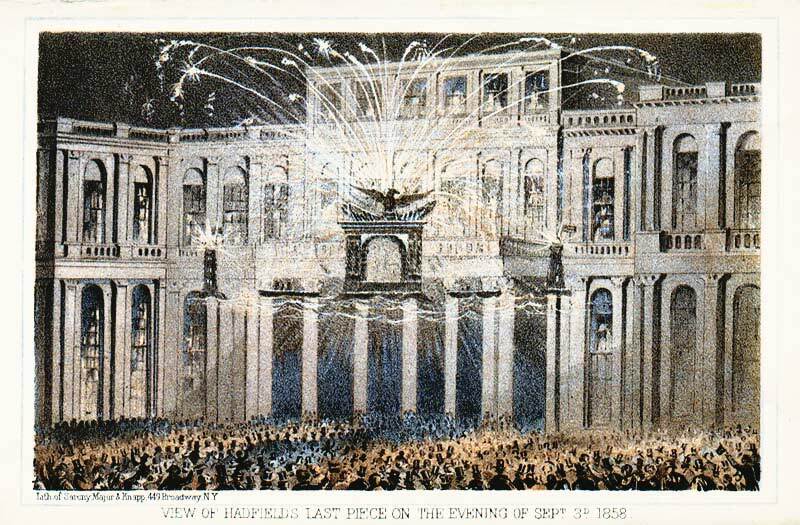 In Boston, Portland, Philadelphia, Baltimore, and other places, bells were rung, salutes fired, illuminations spontaneously undertaken; but in New York the most thorough and systematic display of popular joy took place. A little after daybreak on the morning of the 17th the celebration was commenced by the discharge of cannon in the park; and as the sun rose above the heights of Long Island his rays fell upon an assemblage of cities—New York, Brooklyn, Jersey City, Hoboken, Williamsburgh,—decked in flags and resounding with the merry peal of a thousand bells. But the principal feature of the celebration was the illumination of the city at night, together with the display of fireworks provided by the municipality. Not only that unparallelled thoroughfare, Broadway, was illuminated and decorated for two or three miles of its length, but the lesser streets were also brilliant in many-coloured fires. Wall-street—the centre of American commerce and finance—glittered strangely under the quiet sky. Nassau-street, crowded with newspaper-offices, was a thoroughfare of light. Bonfires blazed in every direction. Transparencies were displayed upon every hotel and many private dwellings. Epigrammatic and laudatory mottoes glowed upon the fronts of granite and marble stores. The City Hall, which stretches its white façade half across the narrow, triangular park, was lit up as never before; every pane in its innumerable windows bore a light. The watcher in the illuminated clock-tower looked down (for the last time, as it proved) on a throng such as the park, used as it is to vast assemblages, has never before contained. 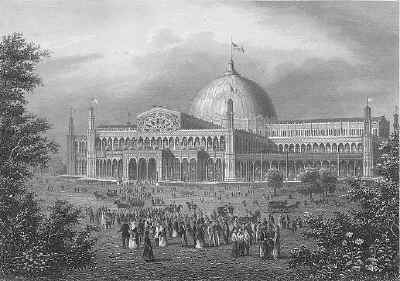 The heavy foliage of the lime and elm trees with which it is studded was scarcely denser than the crowd assembled in expectation of the pyrotechnic display. The night was moonless, and a cloudy sky favoured the occasion, so that by eight o’clock the signal rockets were sent up, accompanied by fire-balloons. Streams of fiery particles and globules of variegated flame shot up far into the heavens, as if to announce to the lightning its final triumph in submission. 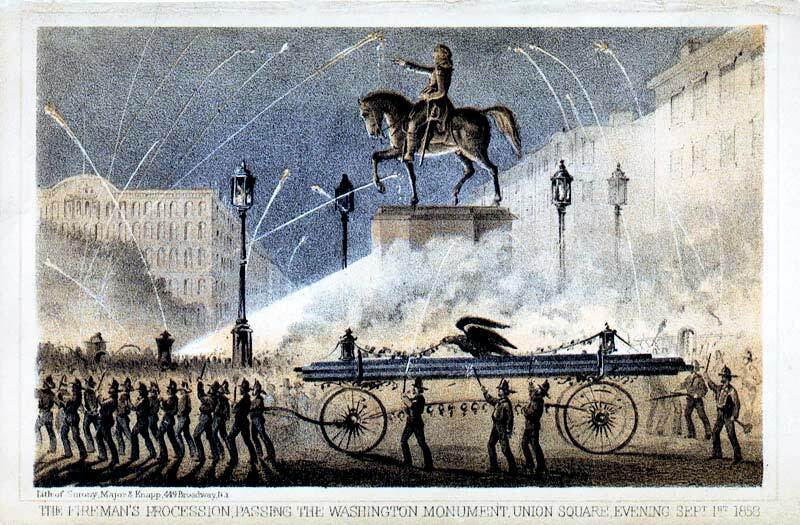 Roman candles rose and fell in perpetual ebullition; erratic rockets hissed and surged upwards in contending streams; serpents, cometlike, darted through the air; and at length the great flame-structures erected upon the wings of the City Hall were fired. 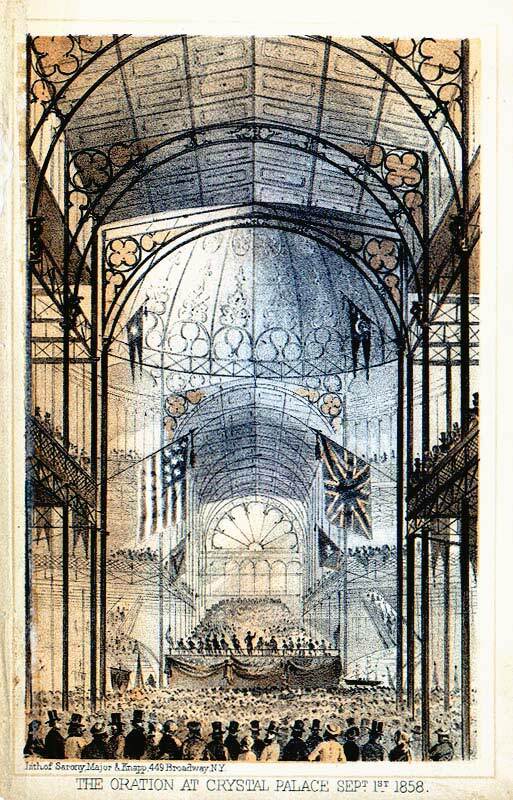 The illumination paled before their rippling lustre; and cheer after cheer arose from the immense assemblage as the designs became developed in succession. 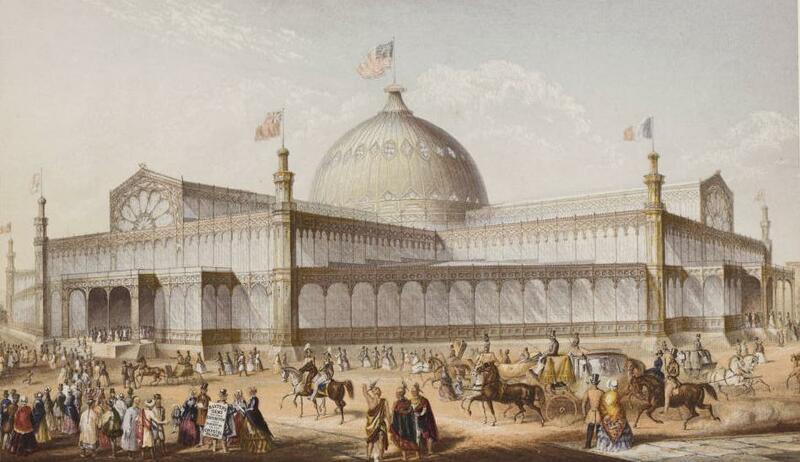 Among the most elaborate pieces was one representing a British and an American vessel, with the union-jack and the stars and stripes at each side, surmounted by the inscription-"All Honour to Cyrus W. Field! 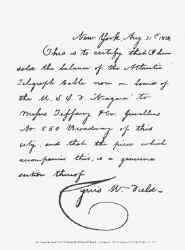 Franklin, Morse, and Field.” (Mr. Field is a gentleman, a resident of New York, who has been very active in the telegraphic enterprise, and Professor Morse was one of the first to elaborate the idea of electro-telegraphic communication.) 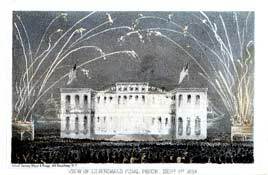 Other pyrotechnics presented similar devices and allusions, during the continuance of which the National Anthem of Great Britain, together with ‘Hail Columbia!” and “St. Patrick’s Day,’ was played by an attendant band. With a further discharge of rockets the display was concluded, and by half-past nine the spectators had dispersed. It unfortunately happened that some sparks fell upon the woodwork of the clock-tower of the City Hall, and flames burst out there about midnight, which finally consumed the tower, and largely damaged the building itself. As the central fire-alarm was located on this spot, the intelligence could not be communicated instantly, as usual, to the engine-houses, and the delay which ensued proved fatal to the structure. The scene, however, was magnificent. The statue of Justice, a familiar sight to all New Yorkers, stood wrapt for a length of time in the flames of the grand illumination, and serenely endured the fiery glow for more than an hour, until at length she was observed to totter and fall into the flames. Many valuable paintings, and some relics of General Washington, were injured by the water; but the city and judicial records were, fortunately, not endangered. Fifty thousand dollars are required to repair the injury caused by this disaster. (now the site of Bryant Park and the New York Public Library). after its use for the Atlantic Cable celebration.